For every perfectly worded ‘thank you’ there is the perfect gift out there somewhere to accompany it. 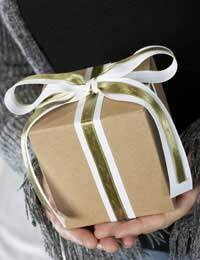 So whether you’ve just been given a quick lift home from work by a colleague or received an urgent kidney transplant courtesy of a loved one, here are some great ideas for gifts that should let them know just how grateful you are. As well as being a vital ingredient for any major celebration, a bottle of champagne is a great way of expressing one’s gratitude (so long as they aren’t teetotal). There are a host of different kinds to choose from and a variety of ways of being a little more creative with your gift. Personalised Champagne – The most obvious way of personalising this ‘thank you’ gift is with your own unique message to the recipient. However, this doesn’t have to mean a few words scrawled in biro. For as little as £40, you can have your message written on a professionally printed label telling the recipient just how much you care. Some merchants even allow you to design the label yourself online. If a label doesn’t quite seem enough, why not consider a champagne gift set, such as champagne and cufflinks for a colleague or truffles for a loved one. Flowers may seem like an obvious choice for a ‘thank you’ gift, but this doesn’t mean your choice of flower has to be an obvious one. Here are a few flowery gifts with a difference. Name a Rose Gift Box – This gift entitles the lucky recipient to have a unique strain of rose named after them for eternity. The gift box comes complete with rose naming instructions, a packet of unique, unnamed rose seeds, fertiliser and a history of roses fact sheet. If they don’t feel like naming the rose after themselves, they can choose whatever name they please, allowing them to be creative with their gift. Whatever they do choose, this gift set certainly has more longevity than your average bunch of posies. Message Egg – Already featured in our budget gifts section, this amazing little novelty item deserves another mention. At first glance the message egg appears to be nothing more than an egg in a plastic can. However, add water, and within a few days something very special happens. The egg will crack open and a tiny beanstalk will emerge, complete with the words ‘Thank You’ printed on the side of a tiny, little bean. A gift that certainly can’t be accused of lacking originality. If there’s someone whom you wish to buy a truly special ‘thank you’ gift, here are a few ideas that really will stick in their memory for many years to come. A Piece of Paradise – Most people dream of owning their own little plot of land on an exotic far-away island. So if you feel like making someone’s dream a reality, you can do just that for less than £30. Once they have filled in and sent off their registration card, they will receive a personalised Land Contract which records them as the beneficial owner of a plot on the Island Harbour Beach Estate on Little Exuma, in the Caribbean. The pack also includes ownership information as well as information about Little Exuma itself. Despite the fact that the plot is probably only half the size of a dinner plate, they’ll still be able to tell people; “Hey! I’ve got myself a little place in the Caribbean, baby!” – Nice, mon! Name a Star – If having a rose named after someone simply doesn’t sound spectacular enough, how about having a celestial body named after them? Who’s going to turn their nose up at that? Their chosen star name will be registered and copyrighted in 'A Personal Guide to the Universe', which is a listing of all new star names and their telescopic co-ordinates. This will then be deposited within the British Library. They will also receive a framed certificate as well as a star chart and a map of the universe.